Power systems are extremely complicated electrical networks that are geographically spread over very large areas. For the most part, they are also three phase networks – each power circuit consists of three conductors and all devices such as generators, transformers, breakers, disconnects etc. are installed in all three phases. In fact, the power systems are so complex that a complete conventional diagram showing all the connections is impractical. Yet, it is desirable, that there is some concise way of communicating the basic arrangement of power system components. This is done by using a Single Line Diagram (SLD). SLDs are also called One Line Diagrams. For practicing electrical engineers and researches, interpretation of single line diagrams in equally important and required skill. We discuss the representation of power system in the form a single line diagram and will show how to interpret single line diagram of any given power system. A single line diagram is method of simplified representation of a three phase power system. Three phases are denoted by a single conductor i.e., power system is assumed in a balanced steady state. In order to analyze a power system under load conditions or upon the occurrence of a fault, it is essential to draw the per-phase equivalent circuit of the system by using its one-line diagram. The equivalent circuit of the system drawn by combining the equivalent circuits for the various components shown in the one-line diagram is known as the impedance diagram of the system. A generator is represented by an emf in series with an impedance. 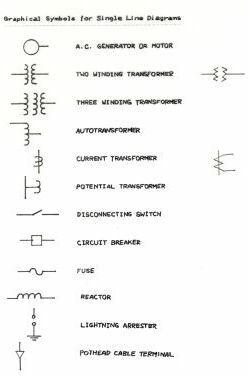 Transformers and motors are represented by their equivalent circuits. A short line is represented by its series impedance. Medium and long lines are represented by nominal PI circuits, whereas very long lines are represented by equivalent PI circuits. The shunt admittance is usually omitted in the equivalent circuit of the transformer because the magnetizing current of a transformer is usually insignificant compared with the full load current. Since the resistance of a syste is very small as compared to its inductive reactance, the resistance is often omitted when making fault calculations. Static loads (i.e., the loads which do not involve rotating machines) have little effect on the total line current during a fault and are usually omitted. Since the generated ems of synchronous motor loads contribute to the fault current, they are always included in making fault calculations. If the impedance diagram is to be used to determine the current immediately after the occurrence of a fault, the induction motors are taken into account by a generated emf in series with an inductive reactance. Induction motors are omitted in computing the current a few cycles after the occurrence of the fault because the current contributed by an induction motor dies out very quickly after the induction motor gets short-circuited. Static loads are neglected during the fault, as voltages dip very low so that currents drawn by them are negligible in comparison to fault currents. If all static loads, all resistances, the shunt admittance of each transformer, and the capacitance of the transmission line are neglected in order to simplify the calculation of the fault current, the impedance diagram reduces to the reactance diagram. These simplifications are applicable to fault calculations only and not to load-flow studies. Since the impedance and reactance diagrams show impedances to balanced currents in a symmetrical three-phase system, they are sometimes called the positive-sequence diagrams. The values of impedances and reactances in the impedance and reactance are found from the data given in single line diagram. Single Line Diagrams do not show the exact electrical connections of the circuits. As the name suggests, SLDs use a single line to represent all three phases. They show the relative electrical interconnections of generators, transformers, transmission and distribution lines, loads, circuit breakers, etc., used in assembling the power system. The amount of information included in an SLD depends on the purpose for which the diagram is used. For example, if the SLD is used in the initial stages of designing a substation, then all major equipment will be included in the diagram – major equipment being transformers, breakers, disconnects and the buses. There is no need to include instrument transformers or protection and metering devices. However, if the purpose is to design a protection scheme for the equipment in the substation, then instrument transformers and relays are also included. There is no universally accepted set of symbols used for single line diagrams. Often used symbols are shown in Fig. 1. The variations in symbols are usually minor and are not difficult to understand. The concept of bus in single line diagrams is essentially the same as the concept of a node in an electrical circuit. Just keep in mind that there is one bus for each phase. Buses are shown in SLDs as short straight lines perpendicular to transmission lines and to lines connecting equipment to the buses. In actual substations, the buses are made of aluminum or copper bars or pipes and can be several meters long. The impedance of buses is very low, practically zero, so electrically the whole bus is at the same potential. 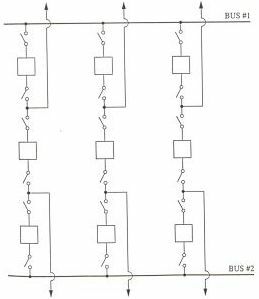 Of course, there is a line voltage between the buses of the individual phases. Single line diagrams like in figure 2 are used to illustrate the layout of buses in a substation. The arrangement of figure two is called a “breaker and a half”. There are three breakers for every two connections of lines or transformers to the bus, i.e. 1 ½ breakers per termination. Figure 5 shows a radial system of two lines. The buses represent two distribution stations. The outgoing lines have breakers only on the supply end. There are current transformers on the supply end of each breaker. The current transformers are connected to overcurrent relays. Dashed lines between the relays and the breakers indicate a functional relationship; in this case operation of overcurrent relays causes the associated breaker to trip. This type of SLD is used for calculation of fault current and setting and coordination of the relays. 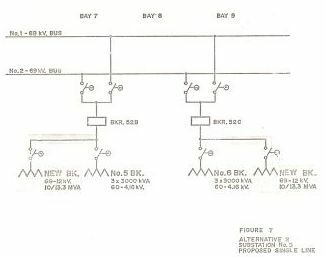 This posts elaborated the use and application of single line diagram in power systems. How to read a single line diagram is also discussed. To learn more about a power system, you may visit the Basic structure and function of a Power System.